Reading through my sports section of The Syracuse Post-Standard on Tuesday morning, I came across a small photograph of British tennis star Andy Murray that caught my eye. That mouth! So elongated, I thought. Was it a special lens used by Associated Press photographer Vincent Thian down there in Melbourne for the 2016 Australian open as Murray defeated homeland competitor Bernard Tomic in three straight sets in the fourth round? Not likely. Sports photography is a straight-on profession, I know from my many years at the big daily. 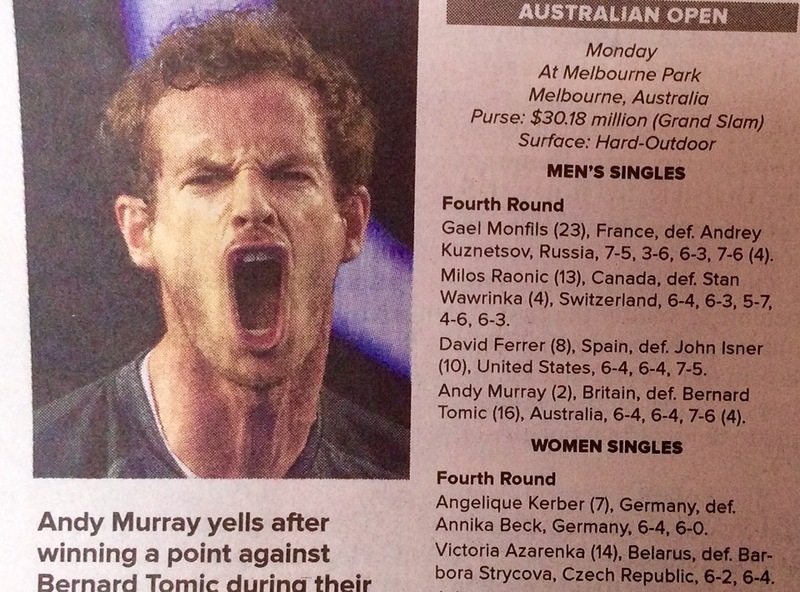 Besides, the rest of Murray’s face looked quite in proportion. Murray’s expression reminded me of a famous image burned into my brain. It’s from the art world. A bit of work on Google revealed the work of one Edvard Munch from two centuries past. 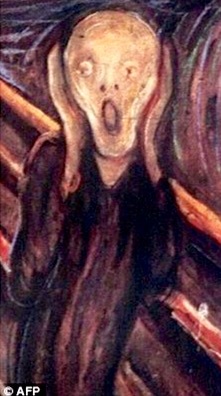 The Scream has been copied and altered with many different faces in the prime position since Munch’s masterpiece in 1893, I discovered. Murray is now a candidate for his famous painting, I think. For the record, the two-time Wimbledon champion has had a tough stretch Down Under. According to the accompanying story by AP reporter John Pye, Andy Murray’s wife Kim is expecting their first child any day, and he’s vowed to leave the competition at any point if she goes into labor. Plus his father-in-law, Nick Sears — also player Ana Ivanovic’s coach — had to be admitted for an overnight stay after being hospitalized while watching her play at Rod Laver Stadium. Enough to make a man scream, yes. Who are your favorite men’s and women’s tennis players, and why? What’s your favorite famous piece of art, and why? What’s your favorite piece of doctored art, and why? I just know I’ll scream with joy the next time you visit my blog, Mark. I have that look on my face right now, Ann, in shame for not visiting. wow The scream and his mouth really do look the same! Good spotting there Mark!